If you ever have dreams of being an evil villain like the one in a James Bond film, you might want to invest in the Paramount Parabolic Multi-Monitor Display. 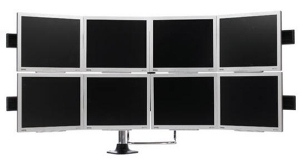 This unique set up from an oddly-named company called Humanscale has a frame for eight monitors. Not only this setup perfect for evil villains, for anyone who is into multi-tasking. I myself usually have three applications going on one screen. For example, as I type this article, I have Firefox running with five tabs, Microsoft Word, and Windows Media Player so I can watch a DVD while I work. Just think of what I could do with eight monitors! I could easily multiply my attention span to eight times, twenty four if I follow my current pattern. With all of these applications going on, I could easily work out my plan to…rule the world! Ha ha ha ha ha! Okay, I’m not a megalomaniac, but I could easily multiply my productivity with this. I find it odd that the frame does not have the metal support pillar directly in the middle, but off to the side. At least that metal branch is there for added support. This unique monitor mount should be available sometime this year, but I’ve heard nothing about a price. Taser parties the latest fad? I hope not. Now for the Intel QX9775 or two.